The sacroiliac joint has been implicated as the primary source of pain in 10% to 27% of patients with mechanical low back pain below L5, utilizing controlled, comparative local anesthetic blocks. The sacroiliac joint is a true diarthrodial joint, the articular surfaces are separated by a joint space containing synovial fluid and enveloped by a fibrous capsule. It has unique characteristics not typically found in other diarthrodial joints. The sacroiliac joint consists of fibrocartilage in addition to hyaline cartilage and is characterized by discontinuity of the posterior capsule, with ridges and depressions that minimize movement and enhance stability. The sacroiliac joint has been described as a synovial joint only in the anterior portion in contrast to the posterior portion. The posterior connection is a syndesmosis, consisting of the ligament sacroiliaca, the gluteus medius and minimus, and the piriformis muscles. The diagnosis of sacroiliitis in clinical practice is based mainly on imaging techniques. It can be difficult to diagnose sacroiliitis in the early and acute stages because conventional radiographs may be normal, although other techniques, to be discussed, might detect sacroiliac inflammation. The radiographic images of the sacroiliac joint changes in advanced disease, sclerosis and may cause erosions. However, this might no longer be visible on the radiograph because of ankylosis. Inflammatory back pain (IBP) can be a result of sacroiliitis. 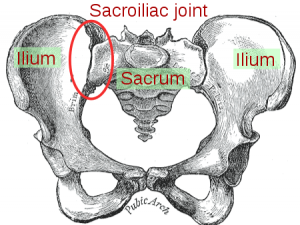 Because IBP is not a highly specific indicator of sacroiliitis, there is a need for valuable imaging techniques. Sacroiliitis of seronegative spondyloarthropathy may sometimes show on pelvis plain films findings indistinguishable from those of osteitis condensans ilii. Computed tomography (CT) can differentiate earlier than plain radiography. There are criteria proposed by the European Spondlylarthropathy Study Group (EESG) that you can use to differentiate the two conditions. There is proof that the criteria are useful. It is right to differentiate clinically between the two diseases. The Short-form McGill Pain Questionnaire (link) and The Assessment of Pain and Occupational Performance may also be appropriate. The SIJ (Sacroiliac joint) Distraction (Colloquially know as Gapping) test is used to add evidence, positive or negative, to the hypotheses of an SIJ sprain or dysfunction when used in the Laslett SIJ Cluster testing. This test stresses the anterior sacroiliac ligaments This test has also been described as the Transverse Anterior Stress Test or the Sacroiliac Joint Stress Test. 1. The patient lies supine and the examiner applies a vertically orientated, posteriorly directed force to both the anterior superior ilac spines (ASIS) (Cook and Hegedus 2013, Laslett et al 2008, Laslett et al 2005, Laslett et al 2003). Because of the lack of standardisation in the technique it is quite feasible different therapists will practise this test different ways, giving rise to variability in response and lowering the inter-tester reliability (Laslett et al 2005, Levin et al 2005). No evidence to suggest either method is preferable (Levin et al 2005), therefore, more evidence needed. The sacroiliac joint can be examined by Special tests. If the condition persists (6 to 8 weeks) with no improvement of at least 50 percent, repeat corticosteroid injections. Subsequently begin strengthening exercises including sit-ups and weighted side bends. Start with general conditioning of the back and increase slowly to low-impact walking or swimming. Take up normal activities with proper care of the back. Other examples of exercises may include: modified sit-ups, weighted side-bends and gentle extension exercises. Strengthening of the pelvic floor muscles is also important because they oppose lateral movements of the coxal bones, which stabilizes the position of the sacrum. Activation of the transversus abdominis and pelvic floor muscles will reduce the vertical sacroiliac joint shear forces and increase the stability of the sacroiliac joint. ↑ Kapura et al. - Cooled radiofrequency system for the treatment of chronic pain from sacroiliitis: the first case-series.